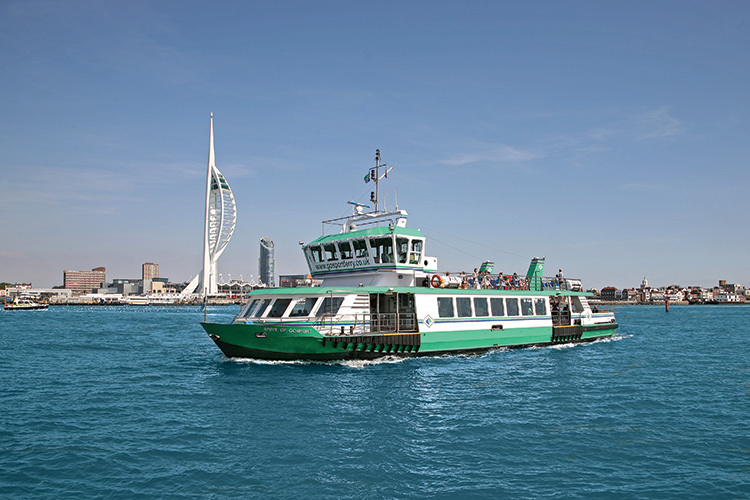 The original Gosport & Portsmouth Watermen’s Steam Launch Company was established in 1875, and after various mergers through the years, became the Portsmouth Harbour Ferry Company Ltd, making it one of the longest running ferry services in the UK. The history of the route across Portsmouth Harbour goes back much further, with wherrymen ferrying passengers across the water from the early 1600s and possibly even before that. 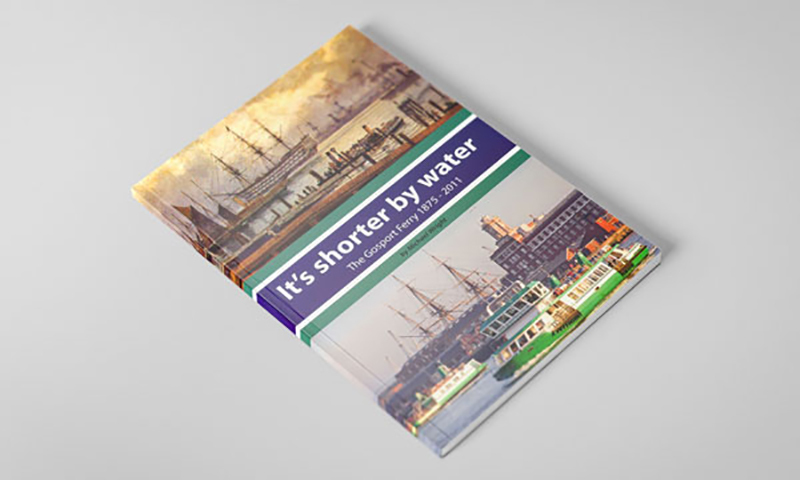 ‘It’s Shorter by Water, a history of the Gosport Ferry 1875 – 2011’ by Michael Wright is out now, and available to order – click here for details. Prior to the 16th century, Gosport was an insignificant fishing village, but in the reign of Henry VIII Portsmouth started to develop as a naval base and dockyard. Many dockyard and naval men lived in Gosport with their families, and as the population grew so did the importance of the ferry service. The ferry service was regulated by an order from the Court of Exchequer, which gave the right to operate the public ferry service exclusively to the inhabitants of the Borough of Gosport. Up until the mid-19th century, and the advent of steam propulsion, all passengers and goods were transported across the harbour by watermen using wherries, a form of double ended rowing boat capable of carrying up to 8 passengers. But in 1840 a Floating Bridge arrived on the scene. It was 100 feet long and 60 feet wide, with two steam engines driving heavy oak cogs which engaged on iron chains laid out across the harbour. It transported carriages, carts, horses and even cattle as well as foot passengers, crossing the harbour from Point (Old Portsmouth) every 15 minutes for 14 hours a day. Its arrival was well timed, as in 1841 the railway came to Gosport and harbour traffic greatly increased as travellers from Portsmouth crossed to get to the new station. The response of the Gosport watermen to the introduction of the floating bridge was to invest in steam launches. These versatile little boats quickly became popular, and by 1870 had re-captured a great deal of the cross harbour passenger traffic lost to the floating bridge. The Floating Bridge Company then invested in steam launches of its own for foot passengers, complementing the floating bridge service. These were also an instant success, and the Floating Bridge Company was once again making healthy profits at the expense of the watermen. A group of Gosport watermen, realizing that as individuals they could not hope to compete with the steam launches of a well organized company, decided to pool their resources and work together to provide a regular and reliable service to match the schedules of the Floating Bridge Company. They formed the Gosport and Portsea Watermen’s Steam Launch Company, acquiring their first four launches from individual watermen in return for shares in the company. It was now the turn of the watermen to enjoy a spot of good fortune as in this year, the rail service to London was extended from the Portsmouth & Southsea terminal to a new station alongside the Hard at Portsmouth Harbour. Furthermore, the Act of Parliament which allowed this extension required that a free public landing stage be provided alongside the station. This was an immediate boon to the Gosport watermen. They could now run their launches right up to the railway station, giving their passengers access to the new direct train service to London. The success of the Gosport and Portsea Watermen’s Steam Launch Company persuaded others to follow suit, and in 1883 a rival company was formed called the Port of Portsmouth Steam Launch and Towing Company. These became known as the Old Company and the New Company respectively. Rivalry between the two companies during their early years was keen. There are many stories of bumping and boring by rival boats in their attempts to carry most passengers to and fro. It is said that Gosport boys attending school in Portsmouth looked upon this as fine sport, leading to contests between them to see who could change boats most times during the crossing. It was a point of honour to land at the other side on a different boat from the one on which they had started. Such a state of affairs could not last for long and in 1888 an understanding was reached whereby a launch of one company would leave each terminal simultaneously at the sound of a bell. Immediately after their departure tickets would be issued for launches of the other company until their departure. Eventually an arrangement was made for the ferry takings to be pooled and shared between the companies. By now, the floating bridges were showing their age, their service was faltering, and with petrol no longer being rationed many users started to take the longer road route. Revenues fell, repair bills mounted and the floating bridge eventually ceased operating. 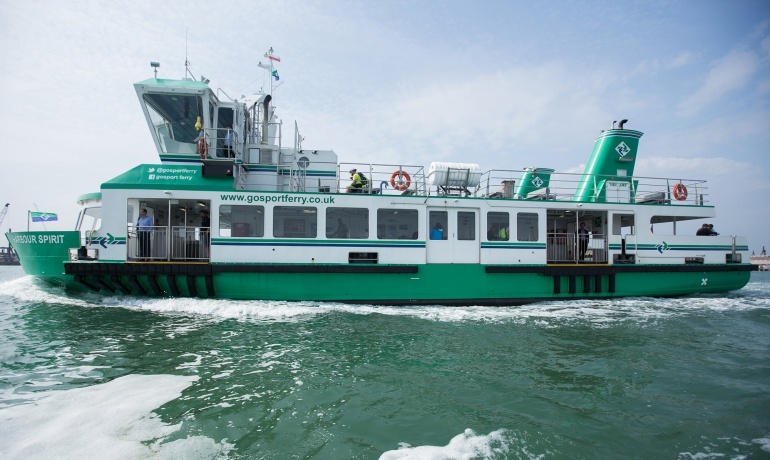 The two companies, after several years of talking about the idea, agreed to amalgamate, with the New Company changing its name to The Portsmouth Harbour Ferry Company (PHFC) and taking over the Old Company. The Portsmouth Harbour Company was taken over by Falkland Islands Holdings plc, which operates a range of property, retailing and shipping businesses.